Since the late Eighties when housing growth took off in Green Valley, Blue Haven has been a leader among inground pool builders. Our experience building custom pools and spas throughout the area—as well as our exceptional reputation for swimming pool construction—has earned us an A+ rating as an accredited BBB business. Homeowners seeking a stable, reliable Green Valley swimming pool contractor will appreciate our long history of excellence. While many Nevada pool builders closed their doors during the 2008 recession, our office continued to provide quality services and steady operation throughout that time and through today. Whether you are looking for a complete remodel and modernization or new gunite pool & spa construction, our experienced team of skilled designers will work with you to create a custom plan to suit your style preferences, needs, and budget. 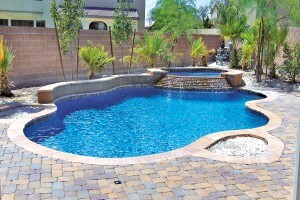 Inground pool designs and pricing are reviewed in detail so you understand all of your options. Small backyard? We can provide pool design solutions for small yards. Big family? 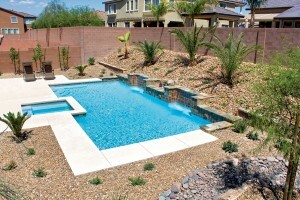 We can develop a pool & spa configuration to best meet everyone’s needs. Our designers consider your space when creating your custom inground pool; we can accommodate all shapes and styles of pools & spas. Many of our most popular designs channel our beautiful desert landscape with organic, flowing designs crafted from faux or genuine rockwork. For cooler months or brisk desert evenings in Green Valley, you want to be able to still enjoy your backyard space. With that in mind, our pool-installation team can include optional features to keep the temperature of both your pool and patio area comfortable. Installing an efficient pool heater and a fire bowl or custom-built fire pit around your deck can extend outdoor entertaining and pleasure through every season. Blue Haven clients enjoy special benefits when considering the cost and convenience of owning a Green Valley inground pool. Not only are our custom pools & spas beautiful, they feature our exclusive, high-tech equipment which automates pool care, trims chemical needs, and cuts water and energy use. Thus, they reduce maintenance costs and enhance swimmer comfort. Naturally high levels of calcium in Nevada water can quickly damage and reduce the beauty of traditional plaster surfaces. Our SmartBrite® color quartz finish is a more attractive, more durable option for lasting style. Compared to DE or sand filters, our high-capacity cartridge filters not only save hundreds of gallons of water, they are also easier to maintain. Sundek® concrete not only looks fabulous, it’s also stain-resistant and offers a wide selection of colors, styles, and patterns. Designed for hot summer use, Sundek® is slip-resistant and boasts a special coating that helps keep your patio cooler on bare feet. Blue Haven has an incredible track record when it comes to helping our Green Valley clients obtain competitive loans for financing pools & spas. Even when home improvement loans were exceptionally difficult to obtain in throughout Nevada during the recession, our swimming pool contractor firm had the financial competence and banking-industry knowledge to continue securing affordable pool financing. Then and today, we partner with lenders to provide a one-of-a-kind funding program for new inground pools, upgrades, and remodels. Contact us to schedule an in-home appointment for your new inground pool. We are happy to explain pricing and options in the comfort of your own home.